What’s that creaking sound you hear? Don’t worry, it’s not your knees. It’s just IWM, which rallied the equivalent of 1.4 standard devs yesterday but still failed to keep up with its bigger cap brethren. While SPY, QQQ and DIA rally to record or near record highs, IWM has been content to be pretty much flat for the past two months. Naturally, that’s reflected in the RVX (the VIX of the Russell 2000) sliding under 16, and that’s made IWM’s IV rank 12. That means speculations are best expressed with debit spreads. So, not to pick on the weak index, but you might think that if the market sells off IWM could lead the way lower. 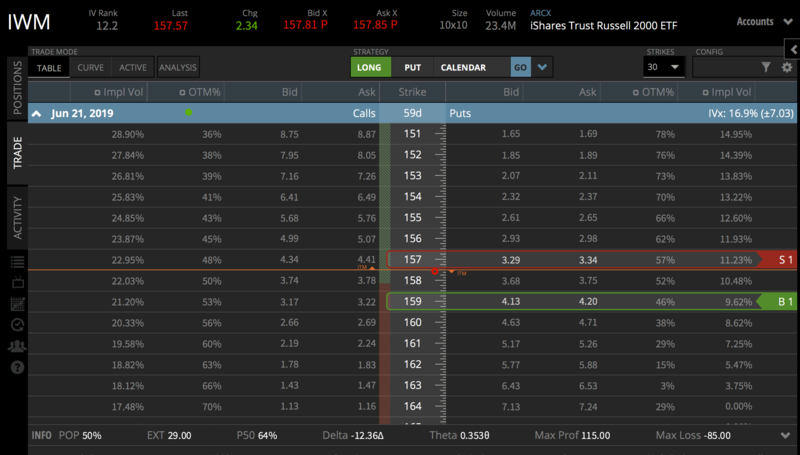 If you are bearish on IWM, the long put vertical that’s short the 157 put and long the 159 put in the June expiration with 58 DTE is a bearish strategy that has a 61% prob of making 50% of its max profit before expiry and that generates $.35 of positive daily theta. Watch the live show starting at 7:00amCT!